This chapter focuses on the role of the news media in the creation, maintenance, or disruption of business legitimacy. The chapter first introduces the concept of legitimacy in organization theory and describes the evolution of new institutionalist approaches to legitimacy. The chapter then turns to the role of the news media, which are often seen as a conduit for public opinion with respect to business. Recent scholarship has come to question this passive view and has begun to examine how news media per se exert an influence on business and public opinion. Drawing on research on agenda setting and mediatization, the chapter argues that the news media should be viewed as an independent political institution, embodying particular values and beliefs and playing an active role in the preservation or challenging of organizational legitimacy. This chapter addresses how the news media affect business legitimacy. The point of departure will be institutional theories of organizational legitimacy and work in media sociology and organization and management studies that examines the role of news media in the creation, maintenance, and disruption of organizational legitimacy. 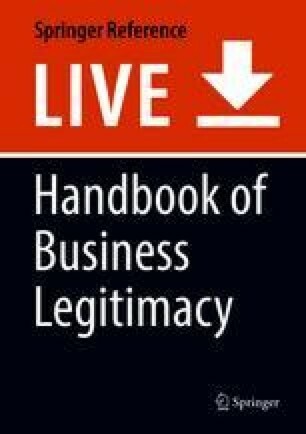 The chapter builds on a descriptive approach to legitimacy. A descriptive approach is not preoccupied with the validity or desirability of particular organizational or societal values. Rather, it is preoccupied with the role that such values play in constituting particular organizational entities or activities as legitimate. The emphasis in the following is on the institutional role of news media. Organization and management researchers often use mass media reports as data sources either to map the actions of organizational actors or as a proxy for “public opinion.” Until recently, the distinct role and contribution of media and journalism were scarcely considered. In contrast, the argument in this chapter will be to view mass media as institutions in order to highlight how they play a distinct role in relation to organizational legitimacy. They do not simply reflect broader social values but embody, produce, and reproduce particular values and beliefs. The chapter is structured as follows: First, it introduces the concept of organizational legitimacy and its key dimensions and describes the evolution of approaches to organizational legitimacy within institutional theories of organization. The chapter then examines the distinct role of media in creating, maintaining, or disrupting business legitimacy, first by challenging conventional views of media and business, then by drawing on the concepts of agenda setting and mediatization to describe the institutional role of news media, and finally by describing the role of news media in relation to organizational legitimacy. The concept of organizational legitimacy stipulates that organizations rely on social acceptance and not only on operational efficiency in pursuing their goals – and indeed to survive. The American sociologist Mark Suchman has offered one of the most influential definitions of organizational legitimacy: “Legitimacy is a generalized perception or assumption that the actions of an entity are desirable, proper, or appropriate within some socially constructed system of norms, values, beliefs, and definitions” (Suchman 1995: 574). Organizations always face one or more constituencies or audiences upon whom they rely for approval. Legitimacy involves evaluations (passive or active) that render particular actors and actions appropriate or acceptable. Such evaluations build on a broader system of norms, values, beliefs, and definitions. This system is both a generalized property of organizational environments and, at the same, a social and historical construct, amenable to change. Suchman’s definition draws on several theoretical sources. Max Weber is often cited as the originator of the modern sociological concept of legitimacy, according to which “action, especially social action which involves a social relationship, may be guided by the belief in the existence of a legitimate order” (Weber 1978: 31). The American sociologist Talcott Parsons later rearticulated Weber’s definition, in his introduction to a modern sociological theory of organizations. Parsons stated: “the value system of the organization must imply basic acceptance of the more generalized values of the superordinate system” (Parsons 1956: 67f). Conformity or convergence between specific organizational values and broader social beliefs or values was seen a prerequisite of organizational action. Therefore, any organization has an institutional dimension, alongside its task- or goal-oriented function. Theoretically, however, the latter function remained at the forefront of organizational theorizing (and business studies). From the mid-1970s, the legitimate order or the generalized values of society changed from being a background assumption in organizational theory to a key theoretical issue. In their seminal article on institutionalized organizations, John Meyer and Brian Rowan (1977/1991) suggested that modern organizations were increasingly subject to the forces of highly institutionalized environments in ways that increased formalization (or bureaucratization) regardless of the technical or operational requirements of individual organizations. The authors stated that “formal structures of many organizations in postindustrial society…dramatically reflect the myths of their institutional environments instead of the demands of their work activities” (1977: 41). In this view, legitimacy is not a background condition but a force that imposes new and potentially disruptive structural and procedural demands on organizations. Institutionalized environments, which encompass state institutions, professional associations, trade associations, etc., embody rationalized institutional rules that define roles, status, and appropriate ends and means for particular organizations and actors operating within their confines. Institutional environments justify actors and actions but may also withhold justification – which may have serious consequences: “Organizations that … lack acceptable legitimated accounts of their activities…are more vulnerable to claims that they are negligent, irrational or unnecessary” (Meyer and Rowan 1991: 50). From these early formulations came a surge of organizational scholarship that both expanded on the idea of institutionalized environments and identified legitimacy as a key organizational concern. The new institutional perspective on organizations involved new and more complex ideas of the nature of the legitimating values and beliefs. W. Richard Scott (1983) summarized the bases of legitimacy in terms of a typology of institutional rules: regulative rules, normative rules, and cognitive rules. In other words, institutional environments encompassed both formal and informal behavioral expectations as well as broader cultural systems of knowledge and meaning. Suchman (1995) added the category of pragmatic legitimacy to indicate that legitimacy may also involve more mundane and interest-based assessments by stakeholders of the value of organizations. The interest in legitimacy involves a shift from a “logic of consequence” to a “logic of appropriateness” in social science inquiry (March and Olsen 1989). In an age preoccupied with rational decision-making, markets and the celebration of management, building on a model of rational choice, focusing on legitimacy, reinstated an interest in the social nature of choice and action. Institutional scholars thus challenged the prevailing micro-theories of action and insisted on a sociological and contextual understanding of decision-making, action, and motivation. Here institutional theory offers a meso-level approach that situates organizations and organizational actors in particular institutional environments that are themselves “organized.” Rules of legitimacy may very well be “generalized,” but they are also carried by and reproduced by particular institutions that confer legitimate status upon individual organizations or groups of organizations. Paul J. DiMaggio and Woody W. Powell drew on the sociological concept of “field” and described how organizations are part of organizational fields that are “sets of organizations that, in the aggregate, constitute a recognized area of institutional life; key suppliers, resource and product consumers, regulatory agencies, and other organizations that produce similar services or products” (1991/1983: 64f). Within a field, there are particular organizations that have the capacity to evaluate or pass judgment on individual organizations. Institutional scholars have often highlighted the role of the state and professional associations as key sources of legitimacy (or challenges to legitimacy), using legislation or defining professional norms and standards for organizations in the field. Research into the dynamics of organizational fields has tended to be preoccupied with the structure of fields and with institutional effects. At the field level, the key question is the following: What structural characteristics lead to intensified pressures for legitimacy? Field-level explanations have emphasized increased state involvement in particular sectors, industries, etc., processes of professionalization, and the concentration of capital and power within an industry. At the organizational level, the key question concerns institutional effects: What are the effects of environmental legitimacy pressures on the individual organization. Here, one observed the ongoing proliferation and elaboration of formal organizational structure, leading to increasing uniformity across organizations, industries, sectors, and nation-states. Referencing Max Weber’s notion of “the iron cage” of rationality, created by modern capitalism, the authors described new iron cage created by “the structuration of organizational fields,” sustained by state policy and professional associations, leading to increasing homogeneity “in structure, culture and output” (DiMaggio and Powell 1983/1991: 64). Over the last 20-30 years, however, institutional research has gradually moved away from this largely determinist approach and has embraced approaches that highlight context, process, and agency (see Lawrence et al. 2009). Context. Researchers have highlighted the evolution and dynamics of specific contexts when seeking to identify the role of institutions and the nature of institutional outcomes. Institutional environments have histories that may be both unique and discontinuous and involve a distinct variety of institutional actors. A large body of institutionalist scholarship has examined changes in institutional contexts over time or across regions, nation-states, and industries. Such studies suggest that, although one may observe the spread of seemingly universal organizational values and beliefs in most developed economies, there are significant differences in the timing, the selection, and the concrete adaptation of legitimate organization forms. Here factors such as the role of the state or the structure of firms and industry are important contextual factors (e.g., Neil Fligstein 1990). Processes. There is a renewed interest in institutional processes, which embraces at least two types of processes: legitimation processes and organizational agency. In most cases, organizations and organizational actions are simply passively accepted as legitimate as part of the ordinary conduct of business in a field. Many organizations are deemed “proper” after having been subjected to a routine evaluation that follows standard procedure, e.g., as annual audits of financial reports. Sometimes organizations or organizational practices may be debated, which means the appropriateness of particular aspects of the organization is questioned in relation to more fundamental values, e.g., when hiring practices are being challenged or a company’s environmental performance is deemed questionable. Occasionally, organizations are seen as illegitimate and judged as entirely inappropriate within a particular organizational field, e.g., in cases of systematic and pervasive criminal conduct or products/services deemed entirely inappropriate. Agency. By focusing on processes of legitimation, one may highlight both stability and change and discern the particular dynamics involved both in routine processes of legitimation and in highly conflictual processes of contestation. Scholarship, inspired by Pfeffer and Salancik’s (1978) early work on resource dependency that propagates a much more active and strategic approach to legitimacy, describes the ways in which organizational actors (managers, employees) respond to challenges to organizational legitimacy, e.g., by engaging in impression management in the engagement with external actors. Some of these contributions will be considered in detail below. However, even scholarship building on institutional theory has come to focus on process and agency. Some organizational scholars have challenged the notion of “diffusion” in the institutionalist model, i.e., that isomorphism occurs as a process of more unilineal diffusion particular norms, concepts, models of organization, etc. across organizational boundaries. Brunsson and Olsen (1993) suggested that processes of change are much more loosely coupled and open to interpretation than hitherto imagined. Czarniawska and Sevon (1996) proposed that the diffusion metaphor be replaced by the concept of translation to indicate how organizational models and concepts are continuously translated and reworked as they travel to new contexts (how agents respond to institutional pressures and adapt and mediate them through loose coupling, sensemaking, and modification of ideas when implemented in specific settings (translation)). Thus institutional effects are never predictable; one always needs to examine concrete processes of sensemaking translation. The shift in institutional studies of organizational legitimacy away from a structural model of institutional influences toward more contextual and processual approaches thus prompted an interest in intermediary organizations, and an interest in distinct processes of legitimation and delegitimation, and in organizational responses both to legitimation challenges and to the broader institutions that are part of such challenges. Examples of intermediaries at the level of organizational fields are educational institutions, NGOs, and consultancy firms, all of which are important carriers of institutional values, norms, and beliefs. However, a large body of literature suggests that “the media” or more accurately “the news media,” i.e., outlets where there is a predominant focus on news production and where journalists are key content producers, have come to play a key role in creating, maintaining, or disrupting organizational legitimacy. The interest in the relationship between organizations and news media has emerged since the 1990s, primarily in research on corporate or organizational reputation and in research on the diffusion of management ideas and models. From having viewed news media either as information channels or as arenas in which public opinions were being processed, researchers gradually began to raise the question of whether news media should be seen as a source exerting influence in its own right. The study of organizational reputation is preoccupied with collective judgments by stakeholders or “the public” about the status and performance of organizations that may, among other things, create important competitive advantages (or disadvantages) for actors in a market. Early studies in the field of organizational reputation and image (e.g., Fombrun and Shanley 1990; Dutton and Dukerich 1991; Sutton and Callahan 1987; Elsbach and Sutton 1992; Elsbach 1994; Hatch and Schultz 1997) often used news coverage as an important data source in their mapping of cases where the reputation or image of organizations was being challenged. Aside from using news coverage as a data source, these scholars often saw the news media as an arena of public opinion in which image crises played out. They also noted that organizational strategies of impression or reputation management were primarily oriented toward the media, although the actual sources of disruption and influence were often found outside the news media – in the legal system, social movements, etc. (Brown and Deegan 1998). In an important programmatic article discussing the relationship between organizational culture, identity, and image, Hatch and Schultz (1997) noted that external images not only affected organizational reputation but also internal identity: “a negative reading of organizational image by the press can affect organizational identity when news reports are perceived as genuine reflections of organizational activity or intent” (p. 361). Morsing (1999) later illustrated this emerging dynamics in a study of the interplay of (positive) media attention and internal identity change in a Danish manufacturing firm that suggested how organizational actors attach real significance to and act upon media portrayals of organizational reality. In studies of the diffusion of management models in various industries, researchers noted that the professional press, i.e., specialized outlets read by particular occupational groups, were important for the early awareness of new management ideas (Barley et al. 1988; Burns and Wholey 1993). Alvarez (1996) and Mazza and Alvarez (2000), examining the spread of academic ideas of management into business practices, saw the media as important for the popularization of management knowledge. They observed a growth in the coverage of business and management issues by the popular media, where widespread stories of implementation and successful performance were instrumental in linking global management ideas to local contexts. Diffusion research often adopted the notion of carrier in their approach to media (Sahlin-Andersson and Engwall 2000) and not only highlighted the importance of the news media as intermediary organizations but also warranted an interest in whether and how carriers shape the ideas and messages carried. In a parallel vein, adopting the lens of fashion theory, Abrahamson (1996) studied the spread of management fads and fashions, using, among other sources, media content to map the rise and fall of popular management ideals, concepts, and models. He observed that such the media could be seen as a “fashion setting community” and explicitly called for a closer analysis of mass media effects on dissemination. By the early 2000s, several organizational scholars, inspired by these findings, began to theorize the role of news media as a distinct source of influence on organizations (Tsoukas 1999; Deephouse 2000; Mazza and Alvarez 2000; Pollock and Rindova 2003; Kjær and Langer 2005; Kjær 2009; Pallas and Strannegård 2010; Deephouse et al. 2016). A significant first step was to theorize the agenda-setting role of news media with respect to organizations. Agenda-setting theory originated in research on political communication (McCombs and Shaw 1972) as an alternative approach to media effects. (It should be noted that agenda-setting arguments can also be found on the field of organization and management studies, especially in the study of decision-making in organizations (such as in the work of James G. March and John W. Kingdon).) Agenda setting here entailed the ways in which journalists and news media can influence the salience and valence of particular issues simply as an effect of the relative attention given to issues by the news media. The agenda-setting argument rejects the idea that news media can control what audiences think but at the same time asserts that the news media can affect what audiences think about and even offer particular ways of framing issues. Deephouse (2000) argued that even though agenda-setting theory is based on studies focusing on public and political issues, the theory also applies to the study of reputations in a business context. According to Deephouse (2000: 1097), “the media provide a forum where firms and stakeholders debate what constitutes a good firm and which firms have good reputations.” Thus the media both had an agenda-setting role and a role in the social construction of perceptions of actors. Carroll and McCombs (2003) also focused on the news media’s agenda-setting role when it comes to influencing the public’s images and opinions about major corporations. Stating that “the core proposition in agenda-setting theory is that the prominence of elements in the news influences the prominence of those elements among the public” (Carroll and McCombs 2003: 36–37), the authors claimed that a number of contingent conditions “define the situations in which agenda-setting effects are enhanced or reduced” (Carroll and McCombs 2003: 43–44). Among these contingent conditions are the age and size of a corporation since both may affect the newsworthiness of a corporation, the proximity of a firm to news sources (e.g., local newspapers covering firms important to local economy more fully than other firms), and the difference between newspaper sections, especially between general news and specialty news. Thus firms are found to get a more favorable coverage in the general section and a more critical coverage in the business section. Finally, Carroll and McCombs (2003: 44) stressed that news media have a special fascination with CEOs due to their celebrity status and that the coverages of the CEO may have a huge influence on the public’s image of a specific firm. Media framing was highlighted in an influential study by Pollock and Rindova (2003: 631) that investigated how so-called information intermediaries (or infomediaries), such as the news media or financial analysts, affect investors’ impressions and opinions of firms. The authors presented two rival views of the influence of these intermediaries: an economic view where the intermediaries simply convey information between buyers and sellers and an institutional approach that argues that the information intermediaries, particularly the news media, through their framing and exposure of firms, influence what stake- and shareholders perceive as desirable, worthy, and trustworthy. Based on a quantitative analysis of media content, the authors (2003: 640) find clear evidence that news media framing plays an important role in the evaluation of new business opportunities by affecting the salience and perceived value of a firm. Similarly, a number of qualitative studies have identified particular dominant frames in business reporting, such as history, nationalism, or inevitability (Tienari et al. 2003, 2007). The agenda-setting approach can be viewed as an institutional approach. Although it starts from a straightforward measurement of prevalence of themes and positive versus negative evaluations, it directs our attention to selections built into news media organizations and journalistic practice. Routine choices of large versus small firms or old versus young or the prevalence of particular frames such as that of leadership or national status are indicative of a particular set of beliefs, norms, and values that constitute a particular “logic of appropriateness” of media institutions. Thus if we want to understand the influence of news media, we have to understand the routinized judgments and selections built into journalistic work and editorial processes (Deephouse 2000). This is elaborated further in the next section. Over the last 10 years, the relationship between media institutions and organizations has been explored even further by utilizing the concept of mediatization. Here scholars have moved from simply examining agenda-setting and framing effects toward a broader field-level theory of the interaction between news media and organizations. The concept of mediatization, which draws on debates in media studies, can been used to describe the nature of this interaction (Kjær and Slaatta 2007; Pallas 2007; Pallas and Fredrikssson 2013; Ihlen and Pallas 2014; Kantola 2014; Wonneberger and Jacobs 2016). The theory of mediatization builds on earlier institutional studies of the news media (such as Tuchman 1978, and Fishman 1980) but takes the institutional argument a step further. Whereas the classical concept of mediation (Strömbäck 2008) referred to how mass media functioned as a channel of information between politicians and their voters, the concept of mediatization refers to how the news media as an institution in its own right selects and shapes the information (news) that is presented across various platforms such as television, radio, newspapers, and online news sites. Thus the premise of mediatization theory is that the news media in many Western countries, from the 1980s onwards, has developed into an independent institution. This institution is guided by its own rules and norms, often summarized as “media logic” (Cook 1998; Strömbäck 2008; Allern and Blach-Ørsten 2011), and over time the news media as a political institution and its logic have become deeply integrated into different levels of society (Hjarvard 2008; Strömbäck 2008). Studies on mediatization have mostly focused on how mediatization has transformed national politics as both political parties and politicians have adapted to media logic (Esser and Strömbäck 2014; Blach-Ørsten 2016), but, similar to the case of agenda setting research, many scholars have made the argument that the process of mediatization has not only influenced politics but has had just as big an influence on firms and organizations. Thus both Kjær and Slaatta (2007) and Pallas (2007) argue that just as national politics have become mediatized in many Western countries, so have firms and corporations. Based on a study of the rise of the Nordic business press from 1960 to 2005, they argue that the business press in the Nordic countries, but also around the world (Pallas 2007; Reed and Lewin 2005; Kanola 2014), has expanded and an increasing number of journalists have been hired to become business reporters. They also argue that the focus and working routines of business journalists have changed during this period (Kjær and Slatta 2007). From covering macroeconomic issues and labor markets, the primary focus of the business press has become corporations and stock markets. In this environment the news media may influence not only the legitimacy and reputation of a corporation but also its brand and policy (Ihlen and Pallas 2014). Thus studies show that just as the coverage of politics can focus on scandals and crisis (Allern and Pollack 2012), so can the coverage of firms and organizations (Langer and Kjær 2004: Blach-Ørsten 2009; Vallentin 2009). And just as the coverage of politics have seen a rise in the personalization of politics understood as an increased focus on political leaders (Blach-Ørsten 2011), business news have seen an increased focus on the coverage of CEOs and their personality and, sometimes, also private lives (Kantola 2014). It is therefore only natural that modern corporations have incorporated media logic and developed, or tried to develop, a workable relationship with the news media. Writing on corporations and their media practices, Wonneberger and Jacobs (2016: 368) stress that the process of mediatization can affect several processes, levels, and structures in an organization or corporation. Pallas (2007) and Pallas and Fredriksson (2013) argue that the process of mediatization is shaped by various interactions or negotiations between corporations and the news media. Some of these negotiations are front stage, such as press conferences, whereas other negotiations are backstage, for instance, negotiations about access to personal information (Pallas 2007). But Pallas and Fredriksson (2013) do not conclude that one side (the media) or the other (the corporation) controlled the interactions in the long run. Instead both parties are in continued interactions with one another, and these interactions are shaped and negotiated and changed by both parties. Indeed an article reviewing 50 years of empirical research on communication between corporations and the media (Verhoeven 2016: 514) concludes that just one key word can sum up the relationship: interdependence. Summing up, this means that in recent years more and more studies have begun to focus on the news media as an important factor in shaping the legitimacy of firms and business corporations. Increasingly studies have turned to the theory of mediatization in order to better understand the relationship between news media and corporations. A central argument in mediatization studies is the existence of a media logic that not only shapes how the news is produced but that also increasingly becomes adopted by other institutions (Strömback 2008). The news media logic is constituted by three factors according to Esser and Strömbäck (2014: 19): (1) journalistic professionalism, that is, the ideals, norms, and routines that guide journalists in their work (also see Ørsten 2004); (2) commercialism that is to say the economic rationales motivating news media as business organizations; and (3) media technology which is the different media platforms and their affordances. In other words the main argument behind a focus on the mediatization of business corporations and firms is that it is influenced by a certain kind of logic, a logic that in many ways are similar to the “contingent conditions” that Carroll and McCombs (2003) highlight. Thus the media logic influences which types of firms and corporations that the news media focuses on. Central parts of the media logic are the so-called news values or news criteria that journalists apply to select between what is considered newsworthy and what is not. Writing on news values and organizational newsworthiness, Kjær and Morsing (2011) write that Danish business journalists apply the same news criteria to business news as to regular news. Thus they focus on what is current, but preferable also something that also entails the possibilities of conflict and identification. Kjær and Morsing (2011: 25) also point out that Danish business news media tend to focus on national firms and corporations, as well as companies that are publically traded since that is expected to make them more interesting to the public and potential shareholders. How, then, do agenda setting and mediatization influence organizational legitimacy? First of all, the news media, through the processes of agenda setting and mediatization, assign importance and valence, and frame attributes of organizations, which may shape public opinion and knowledge about the organization in question. The news media mirror general social expectations, such as honesty, human rights, or sustainability, but their focus may be shaped by the media logic with a routine focus on conflict or identification. In addition, the news media routinely use business representatives as expert sources (financial analysts, market analysts, etc. ), which may legitimize some types of business as important social actors. News media agenda setting per se does not influence organizational legitimacy. Agenda setting influences which organizational issues and actors are attended to by the public. The prevalence of, e.g., financial reporting over political reporting may install a sense of public importance to corporate financial performance. Similarly the frequency with which a particular organization or executive officer is mentioned may create a sense of familiarity. However, the influence on legitimacy depends on the valence (positive or negative) and framing of news media reporting. Again, the valence of individual news stories does not automatically influence organizational legitimacy, but sustained positive or negative reporting may decrease or increase the likelihood of challenges to legitimacy. Similarly, news media framing may both naturalize and problematize particular organizations and aspects of organizational reality. News frames emphasizing leadership may thus create expectations of individual agency, decision-making, strategy, and initiative by executive officers. Failure to meet such expectations may result in a questioning of management authority by the general public and among internal stakeholders. Similarly, framing events as scandals may create a sense that public trust has been lost or a sense of organizational “stigma” leading to both external and internal calls for remedial action (see also Sutton and Callahan 1987). News media shape worldviews and processes in both organizational fields and individual organizations, both in the short run by reinforcing or upsetting established expectations and also in the long run through a gradual structuration of norms, routines, and interactions between news media, journalist, and organizations. This field-configuring property suggests that news media may, in the long run, affect the broader system of norms, values, beliefs, and definitions of a field (Suchman 1995), i.e., the perceptions or assumptions on the basis of which actors evaluate actors and actions within the field. Thus the long-term trend toward “financialization” of business and organizations or the popularity of “corporate social responsibility” may in part be related to mediatization and new routines and norms of news media production related to business. By default, most firms and organizations are accepted. From a news media perspective, the vast majority of firms are “under the radar.” They are beyond the media gaze and are simply passively accepted. A number of larger, mostly publicly held firms are routinely evaluated. This routine evaluation has expanded in recent decades as news reporting has shifted from the simple listing of shares and commodity prices to the systematic monitoring of quarterly and annual reports, product news, market entries, etc. Usually evaluations follow standard schemata and elicit standard responses, based on highly organized interactions between corporate communicators and business reporters. Such interactions are often asymmetrical as news outlets, working under both economic and temporal constraints, rely on information, news releases, and sources controlled by strong corporate communication offices (Pallas 2007). Some firms are debated, based on sustained poor performance or problematic practices. Here a firm’s claim to legitimacy is being brought into question, typically in a series of news reports, as expectations are not being met, norms are being breached, or status is being questioned. Debating not only involves journalists and corporate communicators but also experts, stakeholders, and other actors speaking on behalf of the public. Debating also typically involves remedial actions on behalf of the involved organizations to regain public confidence. This elaboration of processes of legitimation is indicative of the concrete ways in which news media reporting may influence organizational legitimacy, but it also suggests how there are interactions between news media institutions and organizations. This ongoing interaction can be described as a pattern of action and reaction, but as suggested above the relationship is perhaps best characterized as a case of interdependency (Verhoeven 2016). Much business reporting is effectively “corporate reporting,” based on strategic communication produced by firms. At the same time, many firms depend on media attention in order to reach their customers or stakeholders and manage their role and status in various fields. The two sides thus depend on one another and can be said to engage in a process of negotiation – of attention, valence, and framing – rather than simply a never-ending battle for superiority. This chapter has outlined the concept of organizational legitimacy, which can be described as a particular set of beliefs and norms, a logic of appropriateness, built into institutional environments. News media can be seen as intermediary institutions that both convey and rely on broader societal norms and also exert an influence in and of themselves via processes of agenda setting and mediatization. As institutions, the news media influence legitimacy norms, and processes of legitimation, but also engage in interactions with organizational actors over news production and legitimation. While much research has been conducted in the field of news production, agenda setting, etc. in relation to business and organizations, the interaction and interdependency between media institutions and business should be studied more closely in the coming years, especially in the context of processes of legitimation and delegitimation. The present introduction to organizational legitimacy and the news media has adopted a traditional approach to media communication. Future research will have to look more closely at the impact of social media on legitimacy. Although traditional news media still play the most important part in setting the public agenda even in a hybrid-media society (Chadwick 2017), social media and the interaction between social media and traditional news media with regard to the legitimation of corporations and organizations need to be examined. Here we could find a combination of volatile interactions and, perhaps, lower level of institutionalization deserving attention it its own right.